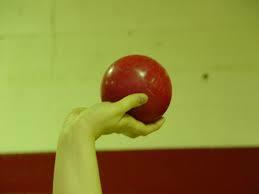 Cup the shot, or heavy ball, with your fingers and thumb along the back side of the ball. Dont touch the shot with your palm, and dont spread out your fingers around the ball. Use your dominant hand.